Finding the access rights that a user has on attributes within a specific entry offers a convenient way for administrators to find and control the access rights. Get effective rights is a way to extend directory searches to display what access rights — such as read, search, write and self-write, add, and delete — a user has to a specified entry. In Directory Server, regular users can check their rights over entries which they can view and can check other people's access to their personal entries. The Directory Manager can check rights that one user has over another user. An administrator can use the get effective rights command in order to better organize access control instructions for the directory. It is frequently necessary to restrict what one group of users can view or edit versus another group. For instance, members of the QA Managers group may have the right to search and read attributes like manager and salary but only HR Group members have the rights to modify or delete them. Checking the effective rights for a user or group is one way to verify that the appropriate access controls are in place. A user can run the get effective rights command to see what attributes he can view or modify on his personal entry. For instance, a user should have access to attributes such as homePostalAddress and cn but may only have read access to manager and salary attributes. There are three people involved in a get effective rights search. The first is the person running the search command, the requester. The rights are checked (with a variety of permutations) to see what rights Person A has over Entry B. The person whose rights are being checked (Person A) is the GER subject; as in, their rights are the subject of the search. The entry or entries to which the person has rights (Entry B) is the target of the search or the search base. Any get effective rights search, both when viewing an entry in the Directory Server Console and searching for it in the command line, shows the rights that User A has to User B's entry. There are two kinds of access rights that can be allowed to any entry. The first are upper-level rights, rights on the entry itself, which means that kinds of operations that the User A can perform on User B's entry as a whole. The second level of access rights are more granular, show what rights for a given attribute User A has. In this case, User A may have different kinds of access permissions for different attributes in the same entry. Whatever access controls are allowed for a user are the effective rights over that entry. Table 18.2, “Entry Rights” and Table 18.3, “Attribute Rights” show the access rights to entries and attributes, respectively, that are returned by a get effective rights search. o Obliterate(mod-del). Analogous to delete. -b is the base DN of the subtree or entry used to search for the GER subject. If the search base is a specific entry DN or if only one entry is returned, then the results show the rights the requester has over that specific entry. If multiple entries beneath the search base match the filter, then the search returns every matching entry, with the rights for the requester over each entry. 1.3.6.1.4.1.42.2.27.9.5.2 is the OID for the get effective rights control. The exclamation point (!) specifies whether the search operation should return an error if the server does not support this control (!) or if it should be ignored and let the search return as normal (nothing). The GER_subject is the person whose rights are being checked. If the GER_subject is left blank (dn:), than the rights of an anonymous user are returned. An optional attributeList limits the get effective rights results to the specified attribute or object class. As with a regular ldapsearch, this can give specific attributes, like mail. If no attributes are listed, then every present attribute for the entry is returned. Using an asterisk (*) returns the rights for every possible attribute for the entry, both existing attribute and non-existent attributes. Using an plus sign (+) returns operational attributes for the entry. Examples for checking rights for specific attributes are given in Section 18.14.3.2, “Examples of Get Effective Rights Searches for Non-Existent Attributes” and Section 18.14.3.3, “Examples of Get Effective Rights Searches for Specific Attributes or Object Classes”. The crux of a get effective rights search is the ability to check what rights the GER subject (-E) has to the targets of the search (-b). The get effective rights search is a regular ldapsearch, in that it simply looks for entries that match the search parameters and returns their information. The get effective rights option adds extra information to those search results, showing what rights a specific user has over those results. That GER subject user can be the requester himself (-D is the same as -E) or someone else. If the requester is a regular user (not the Directory Manager), then the requester can only see the effective that a GER subject has on the requester's own entry. That is, if John Smith runs a request to see what effective rights Babs Jensen has, then he can only get the effective rights that Babs Jensen has on his own entry. All of the other entries return an insufficient access error for the effective rights. User A checks the rights that he has over other directory entries. User A checks the rights that he has to his personal entry. User A checks the rights that User B has to User A's entry. The get effective rights search has a number of flexible different ways that it can check rights on attributes. There are a number of different ways to run GER searches, depending on the exact type of information that needs to be returned and the types of entries and attributes being searched. One common scenario for effective rights searches is for a regular user to determine what changes he can make to his personal entry. For example, Ted Morris wants to check the rights he has to his entry. Both the -D and -E options give his entry as the requester. Since he is checking his personal entry, the -b option also contains his DN. # ldapsearch -x -p 389 -h server.example.com -D "uid=tmorris,ou=people,dc=example,dc=com" -W -b "uid=tmorris,ou=people,dc=example,dc=com" -E '!1.3.6.1.4.1.42.2.27.9.5.2=:dn:uid=tmorris,ou=people,dc=example,dc=com' "(objectClass=*)"
# ldapsearch -p 389 -h server.example.com -D "uid=tmorris,ou=people,dc=example,dc=com" -W -b "uid=dmiller,ou=people,dc=example,dc=com" -E '!1.3.6.1.4.1.42.2.27.9.5.2=:dn:uid=tmorris,ou=people,dc=example,dc=com' "(objectClass=*)"
For all attributes, Ted Morris has read, search, compare, modify, and delete permissions to Dave Miller's entry. These results are different than the ones returned in checking Ted Morris's access to his own entry, since he personally had only read, search, and compare rights to most of these attributes. # ldapsearch -p 389 -h server.example.com -D "cn=Directory Manager" -W -b "uid=tmorris,ou=people,dc=example,dc=com" -E '!1.3.6.1.4.1.42.2.27.9.5.2=:dn:uid=jsmith,ou=people,dc=example,dc=com' "(objectClass=*)"
# ldapsearch -p 389 -h server.example.com -D "uid=dmiller,ou=people,dc=example,dc=com" -W -b "uid=tmorris,ou=people,dc=example,dc=com" -E '!1.3.6.1.4.1.42.2.27.9.5.2=:dn:uid=tmorris,ou=people,dc=example,dc=com' "(objectClass=*)"
However, a regular user can run a get effective rights search to see what rights another user has to his personal entry. In Example 18.40, “Checking the Rights Someone Else Has to a Personal Entry”, Ted Morris checks what rights Dave Miller has on Ted Morris's entry. # ldapsearch -p 389 -h server.example.com -D "uid=tmorris,ou=people,dc=example,dc=com" -W -b "uid=tmorris,ou=people,dc=example,dc=com" -E '!1.3.6.1.4.1.42.2.27.9.5.2=:dn:uid=dmiller,ou=people,dc=example,dc=com' "(objectClass=*)"
In this case, Dave Miller has the right to view the DN of the entry and to read, search, and compare the ou, givenName, l, and other attributes, and no rights to the userPassword attribute. By default, information is not given for attributes in an entry that do not have a value; for example, if the userPassword value is removed, then a future effective rights search on the entry above would not return any effective rights for userPassword, even though self-write and self-delete rights could be allowed. Using an asterisk (*) with the get effective rights search returns every attribute available for the entry, including attributes not set on the entry. # ldapsearch -D "cn=Directory Manager" -W -b "uid=scarter,ou=people,dc=example,dc=com" -E '!1.3.6.1.4.1.42.2.27.9.5.2=:dn:uid=scarter,ou=people,dc=example,dc=com' "(objectclass=*)" "*"
All of the attributes available for the entry, such as secretary, are listed, even though that attribute is non-existent. Taking the attribute-related GER searches further, it is possible to search for the rights to a specific attribute and set of attributes and to list all of the attributes available for one of the object classes set on the entry. One of the options listed in the formatting example in Section 18.14.2, “The Format of a Get Effective Rights Search” is attributeList. To return the effective rights for only specific attributes, list the attributes, separated by spaces, at the end of the search command. It is possible to specify a non-existent attribute in the attributeList, as with the initials attribute in Example 18.42, “Get Effective Rights Results for Specific Attributes”, to see the rights which are available, similar to using an asterisk to list all attributes. The Directory Manager can also list the rights for all of the attributes available to a specific object class. This option has the format attribute@objectClass. This returns two entries; the first for the specified GER subject and the second for a template entry for the object class. Using the search format attribute@objectClass is only available if the requester (-D) is the Directory Manager. Using an asterisk (*) instead of a specific attribute returns all of the attributes (present and non-existent) for the specified GER subject and the full list of attributes for the object class template. An administrator may want to check what rights a specific user (jsmith) would have to a non-existent user, based on the existing access control rules. For checking non-existent entries, the server generates a fake entry within that subtree. For example, to check for the fake entry cn=joe new user,cn=accounts,ou=people,dc=example,dc=com, the server creates cn=template,cn=accounts,ou=people,dc=example,dc=com. For checking a non-existent entry, the get effective rights search can use a specified object class to generate a template entry with all of the potential attributes of the (non-existent) entry. For cn=joe new user,cn=accounts,ou=people,dc=example,dc=com with a person object class (@person), the server generates cn=template_person_objectclass,cn=accounts,ou=people,dc=example,dc=com. When the server creates the template entry, it uses the first MUST attribute in the object class definition to create the RDN attribute (or it uses MAY if there is no MUST attribute). However, this may result in an erroneous RDN value which, in turn, violates or circumvents established ACIs for the given subtree. In that case, it is possible to specify the RDN value to use by passing it with the object class. This has the form @objectclass:rdn_attribute. Operational attributes are not returned in regular ldapsearches, including get effective rights searches. To return the information for the operational attributes, use the plus sign (+). This returns only the operational attributes that can be used in the entry. # ldapsearch -D "cn=Directory Manager" -W -x -b "uid=scarter,ou=people,dc=example,dc=com" -E '!1.3.6.1.4.1.42.2.27.9.5.2=:dn:uid=scarter,ou=people,dc=example,dc=com' "(objectclass=*)" "+"
Get effective rights are returned according to whatever ACLs are in effect for the get effective rights subject entry. # ldapsearch -D "cn=Directory Manager" -W -b "dc=example,dc=com" -E '!1.3.6.1.4.1.42.2.27.9.5.2=:dn:uid=scarter,ou=people,dc=example,dc=com' "(objectclass=*)" "*@person"
If a regular user, rather than Directory Manager, tried to run the same command, the result would simply be blank. # ldapsearch -D "uid=scarter,ou=people,dc=example,dc=com" -W -b "dc=example,dc=com" -E '!1.3.6.1.4.1.42.2.27.9.5.2=:dn:uid=scarter,ou=people,dc=example,dc=com' "(objectclass=*)" "*@person"
Open the Directory tab, and right-click the entry of which to check the rights. Select Advanced Properties from the drop-down menu. Check the Show effective rights check box. Beside each attribute, the attribute-level get effective rights are displayed. The entry-level rights are shown beneath the entry's DN. The attribute-level effective rights (r, s, c, w, o) appear next to the attributes. 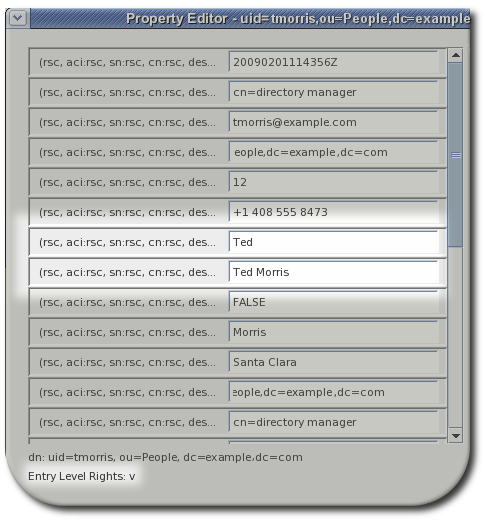 The entry-level rights (v, a, d, n) appear under the full DN for the entry in the lower left-hand corner of the Property Editor. 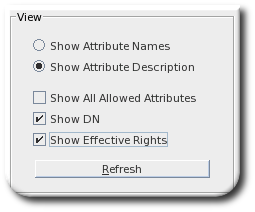 If you check the Show all allowed attributes check box, then the effective rights for those attributes appear next to the additional attributes, even though they do not have values. If the criticality is not set for a get effective rights search and an error occurs, the regular entry information is returned, but, in place of rights for entryLevelRights and attributeLevelRights, an error code is returned. This code can give information on the configuration of the entry that was queried. Table 18.4, “Returned Result Codes” summarizes the error codes and the potential configuration information they can relay. 12 The critical extension is unavailable. If the criticality expression is set to true and effective rights do not exist on the entry being queried, then this error is returned. 16 No such attribute. If an attribute is specifically queried for access rights but that attribute does not exist in the schema, this error is returned.